Hello Imogen. I was hoping you could answer a question for me. I had the opportunity to buy a pair of lined trousers at a reduced price. I didn’t buy them because I’m a wash and wear type of person and the pants would have required going to the cleaners. Can you tell me what the advantage is to having lined trousers? Did I give up a great deal? Lined pants last longer. The lining reduces friction between skin and fabrics so they don’t rub and wear as quickly (fabric thinning between the thighs or around the bottom and seams splitting or fraying). Lined pants hang better. The extra layer of smooth, silky fabric used in the lining will make the garment hang better on your body as it stops the outer trouser fabric from grabbing onto your skin. You can still wash (handwash) lined trousers (depending on the fabric of the trousers) in cold water. If the trousers are wool, you really only need to wash them once every 14 wears as wool is antibacterial and doesn’t need all the washing we tend to treat our clothes to. 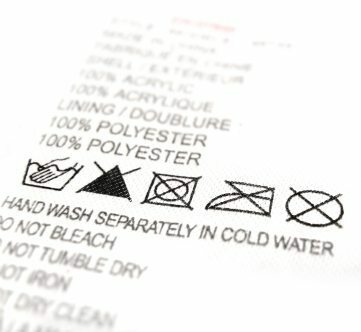 Often garment manufacturers put Dry Clean Only onto labels to cover their butts! Yes lining fabrics and the other fabric may shrink at different rates in different temperatures which is why they suggest dry cleaning but I frequently gently handwash garments that have the DCO tag in cool water then let drip dry, and they come out none the worse for wear. Before you do this, do some internet research on the fibre and suggested care as some fabrics that have metal in them have to be dry cleaned, but many fabrics, like wool can be washed (but never, ever, ever, ever in hot water). You may decide to try washing or you may just want to dry clean once in a while (the pressing the dry cleaner does will always be better than how you can iron!). If the pants are on sale and you’ve done your research on fabric care then you can make an informed decision. A great pair of classic wool, lined trousers could easily last you 10 years and look great. But if your thighs touch when you walk, wouldn’t that mean the outer layer of fabric would wear through the same as it does with unlined pants? In that case, it seems that the only advantage is better drape. Couldn’t you also buy pant liners for unlined pants to make them last longer? Yes – agreed. But where in this new world of BodyCon can you find a great pair of lined slacks!